Is the expensive iPad or Playstation Vita on your child’s wishlist? Then, you’ll be happy to know that LeapFrog has created two devices that will fit your budget and educate at the same time. LeapPad 2 is really the ultimate toy for children. With its tablet-like features, touchscreen, and stylus, the LeapPad 2 satisfies that curiosity. The device is well-built and well-designed. The technical specifications aren’t as large of a boost compared to what you might see in a smartphone or a video game console. It’s an excellent investment in your child’s early learning skills and an entertainment device that keeps their active minds busy. This device is designed for kids 3-9 years old. Next is the Leapster GS. The Leapster GS is a great device for fast-action LeapFrog games because of its size and button controls. It comes with a built-in microphone and back-facing camera. This Leapster GS is designed for kids who are 4 to 9 years old. As far as software, you’ll be glad to know that both systems are essentially backwards compatible. So whether you were using cartridges or downloading apps (priced from $5-$25) from LeapFrog‘s store, all of that content can go back and forth between the devices. That said, the LeapPad 2 comes pre-installed with a music player and a few creativity apps. 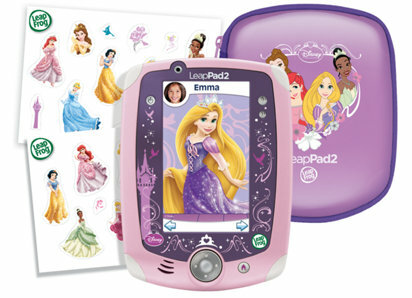 Last but not least, the LeapPad 2 has a Disney Princess-themed bundle that includes a case and other goodies for an extra $30.